Plus Size Purple & Black Gothic Hi Lo Lace Short Sleeve Dress  - $79.99 : Mystic Crypt, the most unique, hard to find items at ghoulishly great prices! 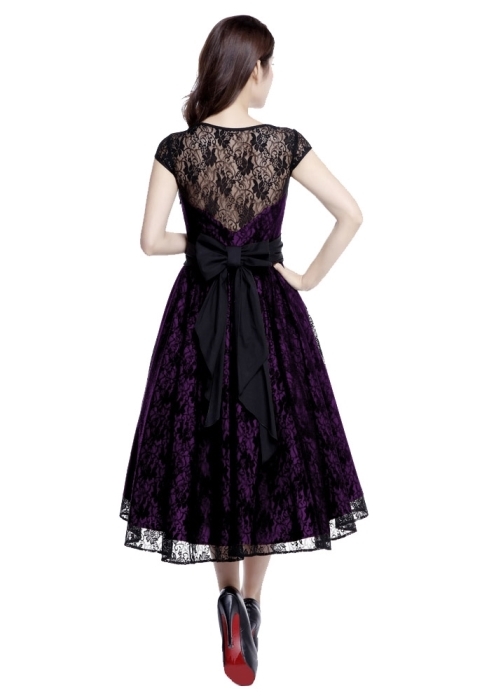 Plus Size Purple & Black Gothic Hi Lo Lace Short Sleeve Dress. This dress pattern features a lace outer layer with a boat-neck, and small cap sleeves. There are 4 darts in the front of the bodice and in the back for shape for both layers. The skirt is full and is longer in the back. There is a removable adjustable belt with a pre-formed bow. Side zip. The petticoat is not included. 1X approx. length: 45 inches; Plus size approx. length: 49 inches. Shell: Lace 90% Nylon, 10% Spandex. Washing Instructions: Hand Wash, Do Not Wring, Do Not Bleach, Medium Iron, Do Not Tumble Dry, Drip Dry. Please read measurements carefully! There is a little bit of stretch to the material, it is VERY flattering to the plus size figure. The MOST IMPORTANT measurement is the BUST!!!! This fits very plentiful on the bust! Order your size by what your bust measurement is!!! If you are in between sizes, size DOWN!